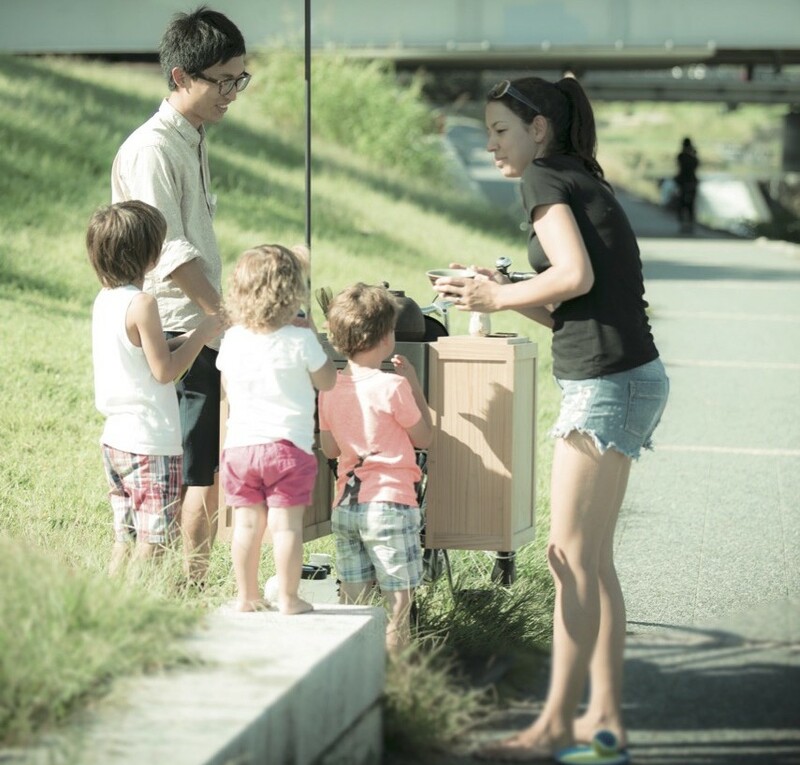 Kamo-cha is a friendly service distributing free tea to passers-by along the Kamogawa river. Loading a cast iron teakettle on his bicycle, Dairiku Amae, dressed in his casual clothes, invites you to sample his tea. All kinds of people stop by for a bowl of tea, from joggers to children and picnickers. Autumn. This is perhaps the busiest season in Kyoto , as we welcome hundreds of visitors from all over the world who come to enjoy the beauty of our colourful, yet subdued gardens. 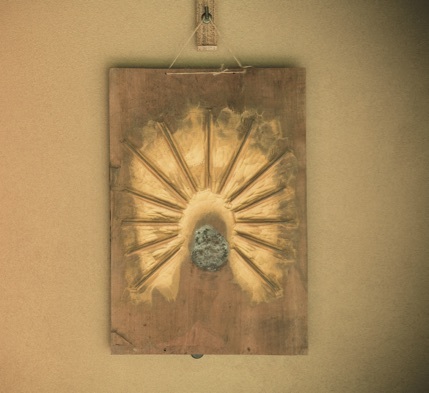 This might be the most opportunate time to tackle something that has been on our minds, and that probably many tourists are pondering about as well: What exactly is the Japanese term wabi-sabi? The Japanese-English dictionary tells us that wabi is “a melancholy feeling found in simplicity” and describes its counterpart sense sabi as “a sense of profoundness in something old and withered.” Hmm. It may help to have some concrete examples. 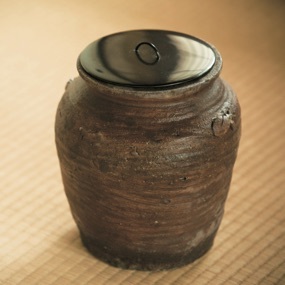 Today, wabi- sabi is understood as a unique notion of Japanese beauty, and it is believed that the development of Zen Buddhism contributed to its formation as an aesthetic concept. 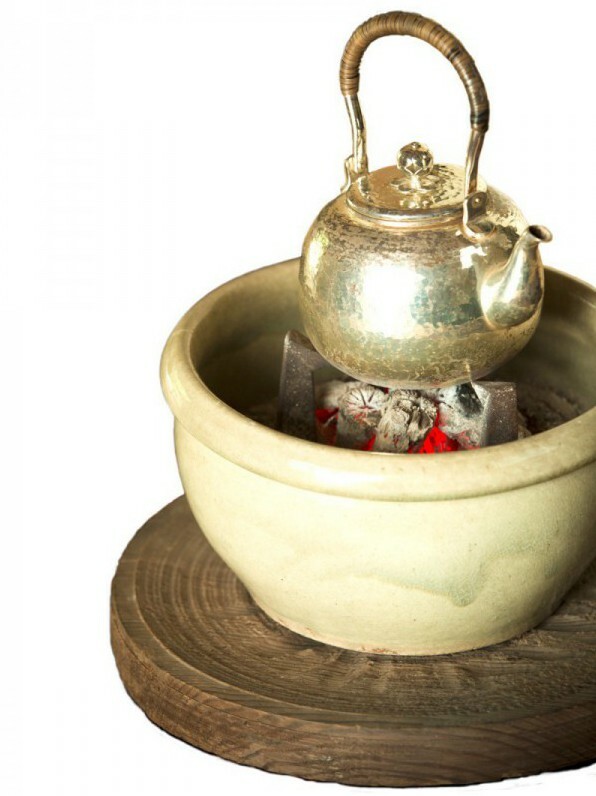 In addition, the close relationship between Zen Buddhism and the Japanese tea ceremony added to the spiritual culture of wabi-sabi. This notion is highly regarded in a Japanese tea ceremony - a practice designed to calm your mind by focusing purely on the processes of making tea in the tranquil environment of a tearoom. Through this act of self- observation, one attempts to heighten one’s awareness. In other words, it’s basically impossible to talk about the theme of wabi-sabi without mentioning the tea ceremony. 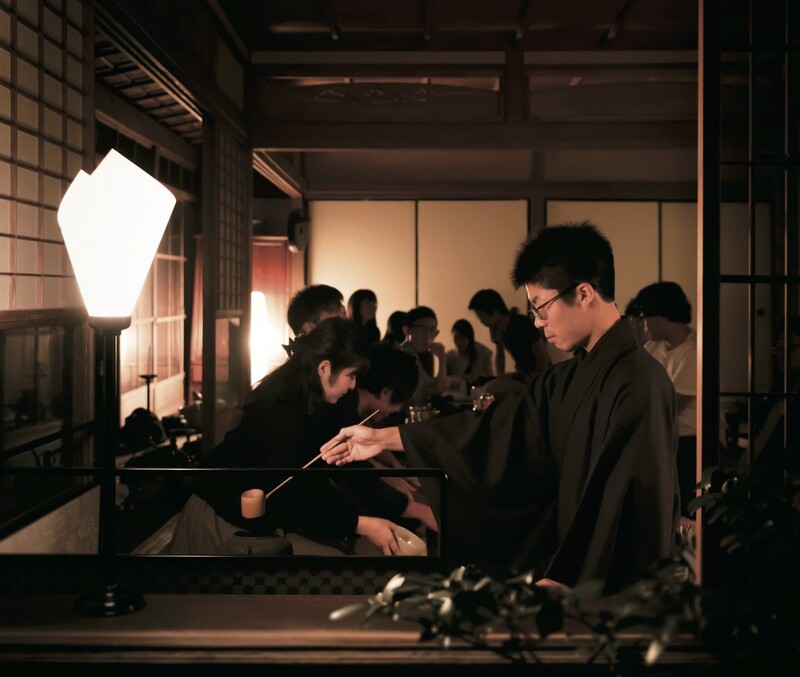 With its 450-year history, chadō, the way of tea, is inextricably woven into with the 1200 years of Kyoto history. 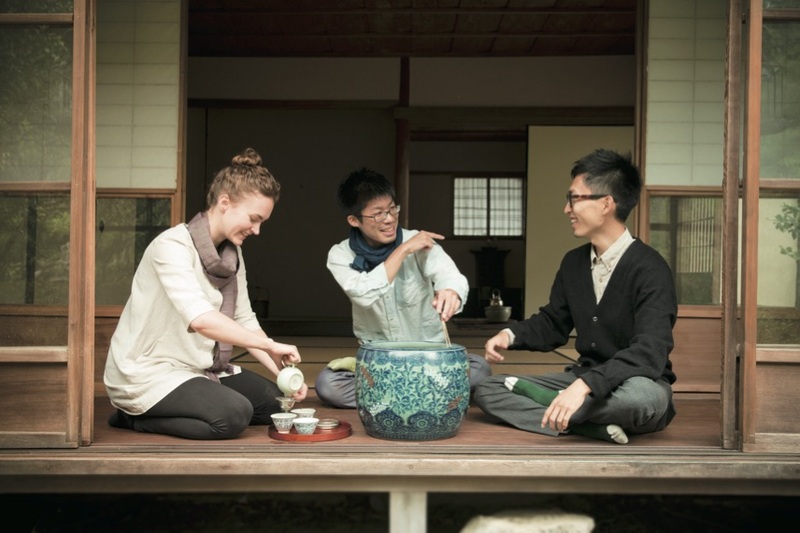 But in this issue, rather than analyzing the historical side of wabi-sabi, we chose to meet with real people- some present-day tea practitioners- and look at how they this concept influences their daily practices. A relatively regular banquet with close friends except for an iron kettle that is boiling with water for tea. 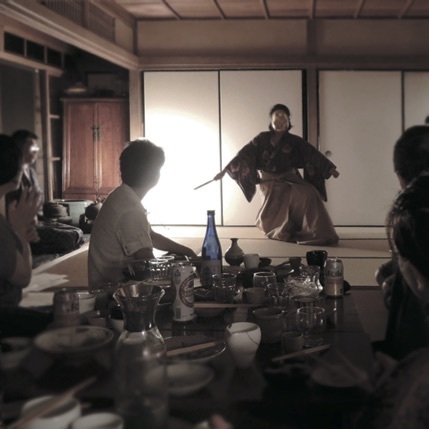 The host, who had already had his exchange of drinks with the guests, changes into kimono and prepares tea as the atmosphere gets ripe. During the Kamakura period, the drinking of matcha spread among the warrior class. Shogun Minamoto no Sanetomo had a severe hang over to which a zen monk Eisai recommended matcha. This helped the Shogun recover, and thus was the start of the spreading of tea. To this day, the host and the guests enjoy the Tea as the night prolongs. It’s true that, in their day-to-day lives, most Japanese people are unfamiliar with Japanese tea in the ceremonial or traditional sense. It feels unapproachable in that it seems too sophisticated or perhaps aristocratic, and one might feel reluctant to practice it without first mastering its methods and manners. This is especially true of Kyoto, a city which prides itself on being a gatekeeper of culture. However, more people practice tea here than anywhere else, and moreover, it is a city where tradition is of the utmost importance. These are exactly the reasons why we were taken aback by the casual offer of beer. The people of Tōtōsha continued to make us feel at ease even as they prepared our tea, telling us to “drink however you feel is best. We want you to first enjoy the tea itself.” It was inspiring to see people of this age incorporate traditional tea in their daily lives in their own way, and it was hard not to feel that there must be something more behind this choice of lifestyle. And so we decided to interview them again. The new face of tea expertise. 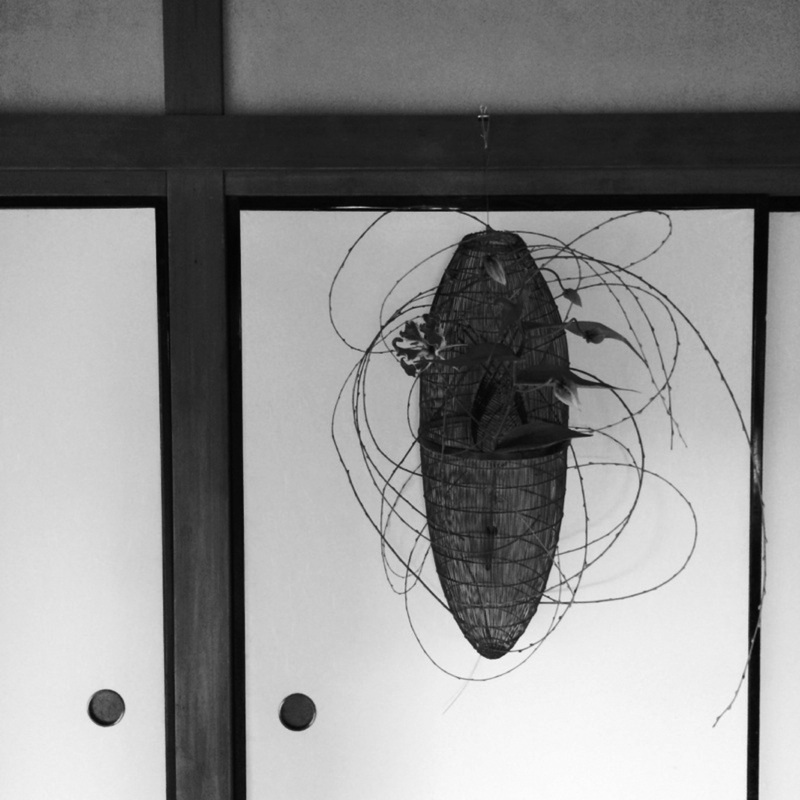 Incorporating traditional culture into everyday life, sustaining Japan’s wabi-sabi culture for future generations. 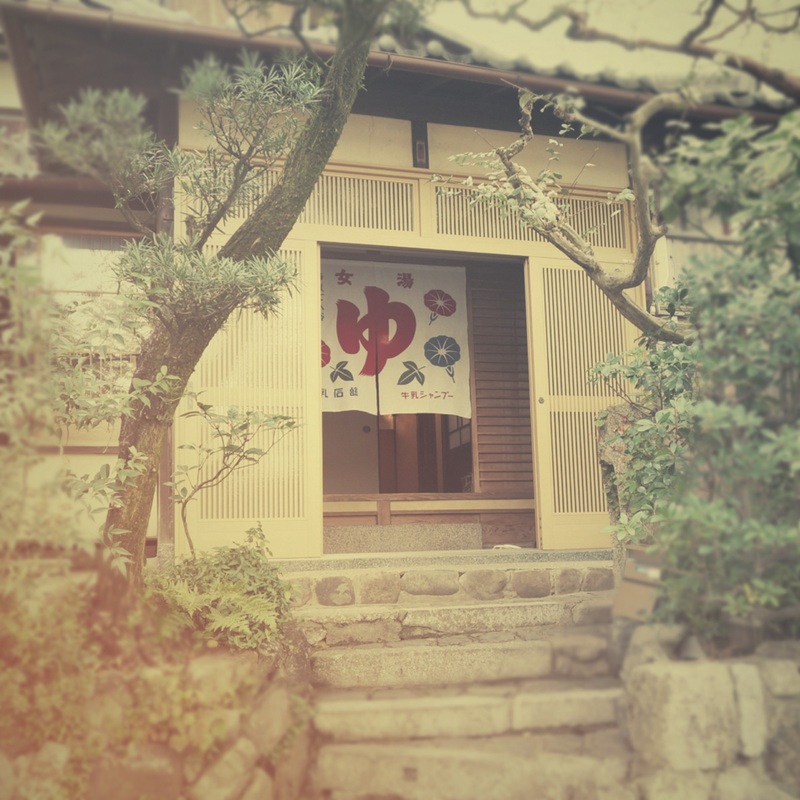 Tōtōsha is the name of their house as well as their innovative tea-lifestyle project. The Tōtōsha trio is made up of Fuku- taro Nakayama, 28, Cristina Geisse (Kiki) , 27, and Dairiku Amae, 26. The group were brought together by Dairiku to start this com- munal project in June 2013, to share a house under the theme of practicing tea. ‘Tea’ here refers to ‘tea as culture,’ that is, the act of making and serving tea called cha-no-yu. The three members each have markedly different upbringings. For example, Dairiku, who started the project, has Japanese nationality but was born and brought up in five countries due to his father’s diplomatic work. He started living in Kyoto when he studied architecture at university, and because of his dream to “design a tearoom,” he entered the world of tea. “Even here in Kyoto, the best place to find culture and tradition in Japan, you don’t see tea in everyday life. This is why I thought I should just start my own. Isn’t Kyoto much more entertaining and special when tea is a part of everyday life?” As mentioned earlier, Dairiku rides his bicycle with a cast iron teakettle on the back, and distributes free tea to passers-by along the Kamogawa river. Whilst in high school, Fukutaro was a member of the Japanese archery club. Captivated by its beautiful body movements, he concentrated on ways of moving the body as gracefully as possible. Inspired by the goal of his favorite word, shinzenbi (lit. 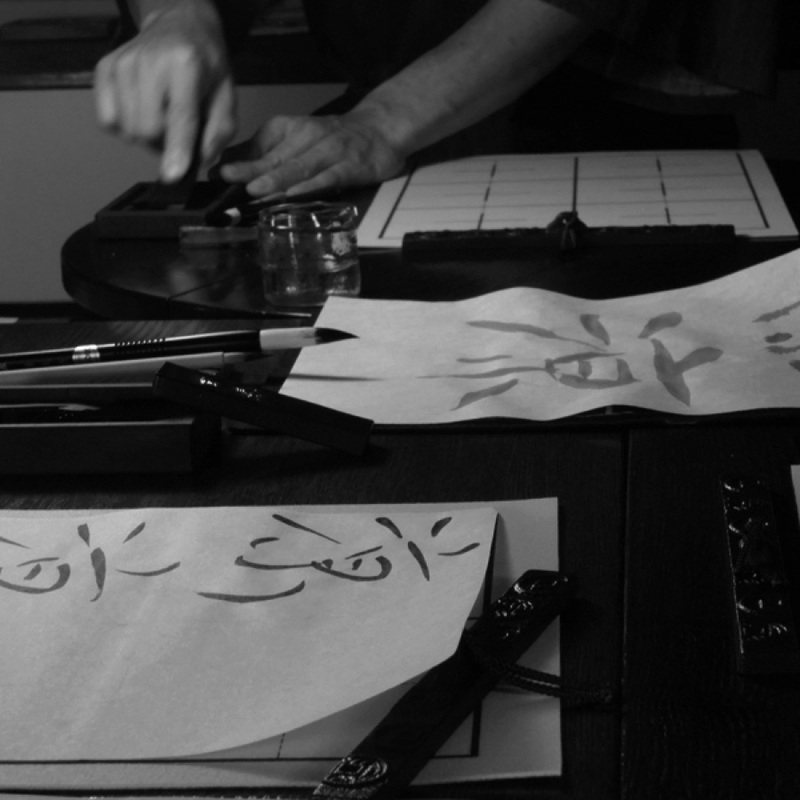 truth, virtue, beauty), he began learning tea ceremony, once he realized the beauty in its movements. Later, a fateful encounter with a foreign tea master completely changed his life into how he lives today. “Everything about my teacher’s life revolved around tea, and his entire house felt like a tearoom. I was so shocked and inspired to see this, because a lot of people don’t necessarily incorporate their daily lives with tea; even if they have a tearoom, their living rooms and hallways are sometimes messy and unorganized.” This is a reason why the entire interior of the Tōtōsha house also looks and feels like a tearoom.There is no TV, and no air conditioning. Their everyday lives are overflowing with creative cultural activities that leave no need for the diversion of television. 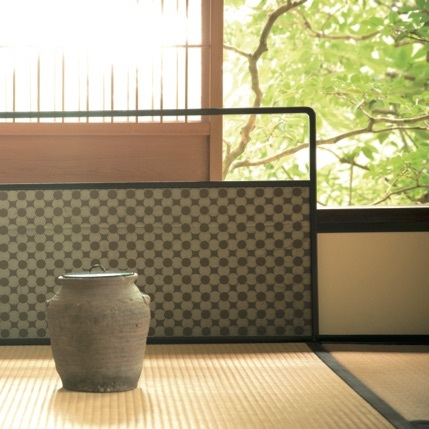 What’s more, air conditioning doesn’t suit the traditional Japanese-style house. They get through the summer by opening all their windows and using paper fans to feel wind, and endure Kyoto’s frigid winters by gathering around a fireplace. And then there’s Kiki. 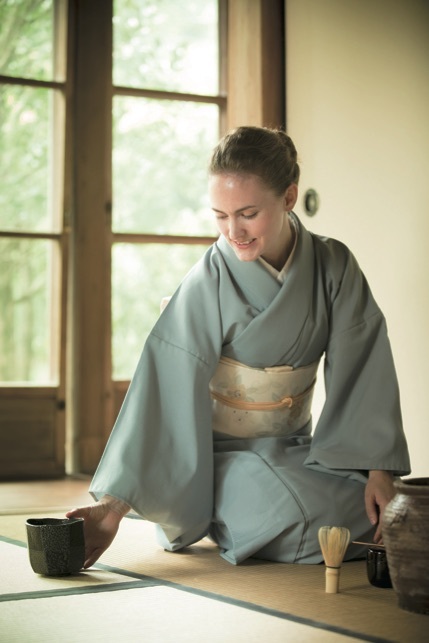 Hailing from Chile, halfway around the world from Japan, she is agreed to have the most tea ceremony expertise of the Tōtōsha trio. Curious about Japanese culture from her childhood, she came to Kyoto to study at a local university. She then studied for one year at the Urasenke Tea School, where she was able to learn in depth its basic manners and movements. When asked what she loves most about tea, she answered, “One can spend 1-2 weeks in order to prepare for one 4-5 hour tea gather- ing. It’s a lot of work, and one might face many challanges, but it is worthwhile. After sharing tea in a quiet and intimate space, one can attain a very deep calm.” And, when asked about how she thinks of Japanese people, she said, “Most are quite stiff. I just wish they could be more relaxed, like when they have had a couple of glasses of beer! But, I do admire their courteousness and their high level of concentration. Everyday I am humbled by their hardwork and relentless commitment to their groups. There’s still so much I can learn from them.” Kiki’s dream is to promote The Japanese Way of Tea in her home country, Chile. “I’m not so confident yet, so I’m starting little by little. I’m going home next January, and I am busy planning a tea seminar with a Zen Buddhist monk residing in Chile.” It seems she’s already on her way in fulfilling her dreams. The three members are commited to sharing their passion for tea. In the case of Fukutaro, this began by serving tea by the Kamogawa river". “My teacher said to me, ‘Someone out there is waiting for your tea. There’s no point in making tea just for the sake of it.’ So I immediately brought my tea utensils with me, and started serving tea below the Sanjō-ōhashi bridge.” Luckily, passers-by who didn’t know much about tea approached him on his first day, and he was able to share on a bit of knowledge. Gradually, he got to know all sorts of people, from groups of university girls to families, and was convinced that he should continue this idea. 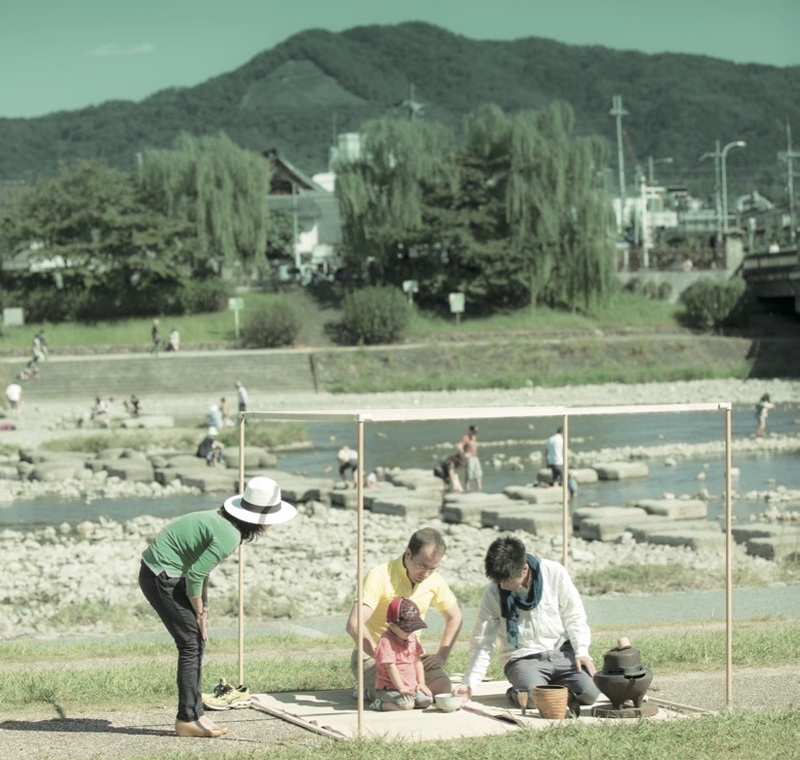 He named this act of serving tea along the Kamogawa river Kamo-cha. 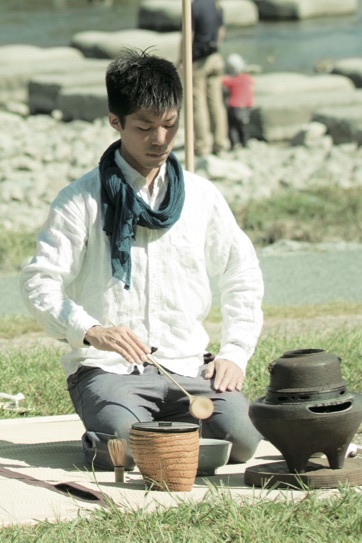 In 2009, he started a group called Kamonkai that performs tea ceremony outdoors with their tea utensils and portable tearooms to distrib- ute tea. Both their works, Tea Cube, (seen on the cover of this issue) and Dairiku’s Tea Kamo-cha are extended versions of previous activities. Today, they’re both signature Tōtōsha events. The three members are each living ￼their individual lives involed in tea, and are promoting the culture of tea to those around them. Regardless of their youth, there is no doubt that by doing so, they’re starting their own new trend of culture. Of course, being based in the ancient city of Kyoto is a huge influence on their work, but more basically, they are taking traditional culture and making it a personal, relevant part of this contemporary world. To live like them might be difficult, and some of the things that come with the lifestyle might not exactly complement the world we’re living in today. However, Sen no Rikyū was also ahead of his times, challenging the status quo. Perhaps one day, what Tōtōsha are showing us might also eventually become a conventional part of life. The city of Kyoto is known for its repeating cycles of tradition and innovation. We might just be witnessing one right now. Fukutaro discovered a public tea ceremony known as “Guerilla Tea,” conducted by a French-American artist, Pierre Sernet who is active in New York city. Inspired by Sernet, Fukutaro contacted him immediately and asked permission to perform a similar series in Japan. 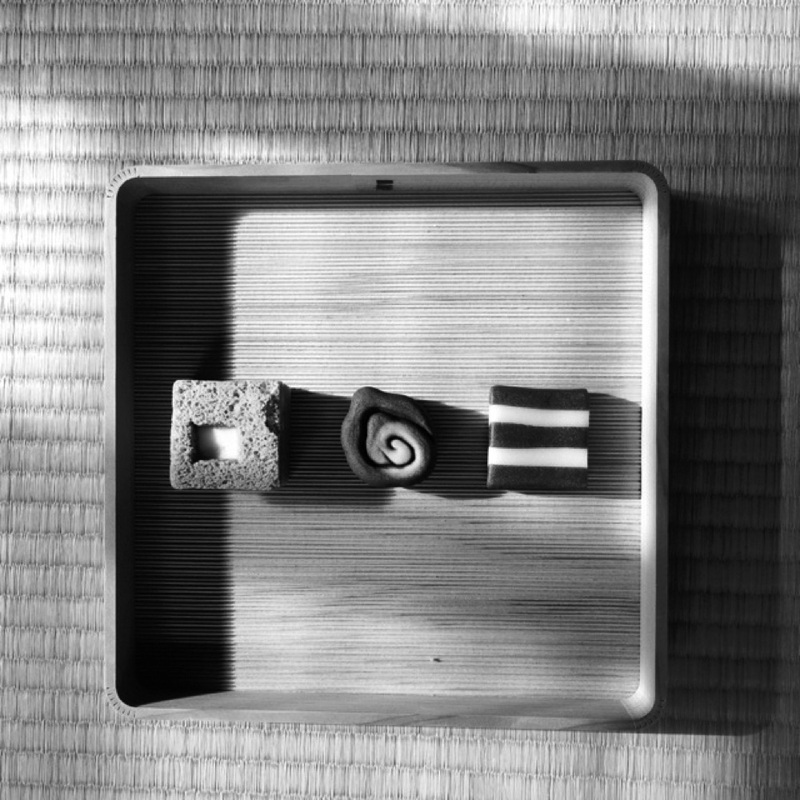 With Pierre’s kind consent, this Japanese version, entitled “Tea Cube”, was created in 2009. Tea Cube is carried out inside a portable two-tatami-mat sized tearoom The space is enclosed by simple wooden frames, creating a uniquely independent mood anywhere the Cube is erected. ￼As Tōtōsha member Dairiku was dreaming of holding an outdoor tea gathering for the public, he came across an image on the Internet. 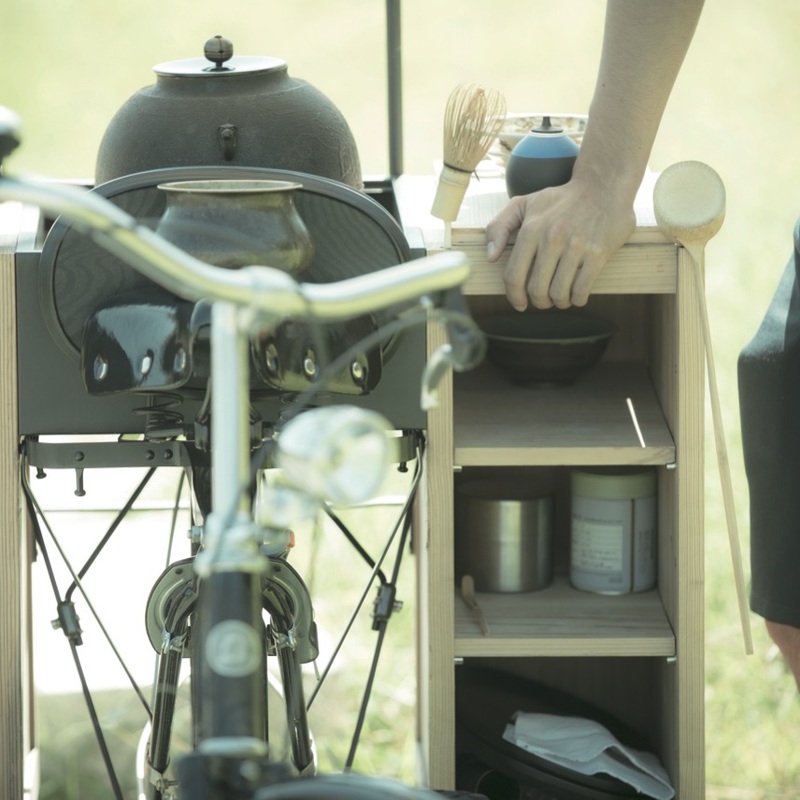 Without any hesitation, he called a woodworking group specializing in Japanese cedar called Sugidarake in Tokyo, from whom he inherited this bicycle. It is in effect a portable tearoom, with a cast iron teakettle mounted on its frame. 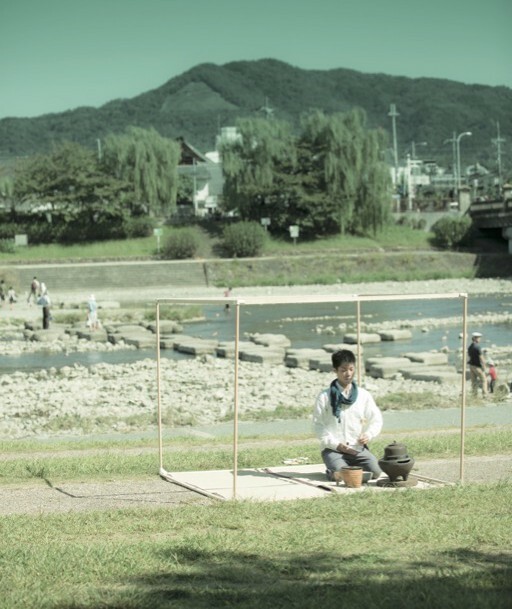 Whenever Dairiku has the time, he can be found serving complimentary tea to passers-by along the Kamogawa river. Wouldn’t it be interesting if a tearoom floated?” said Satomi Fukushima, an abstract painter whom Fukutaro held an exhibition with. Preoccupied by this idea, Fukutaro met with Dusty Wittman who crossed Lake Biwa with a petbottle raft during a charity event for the disaster orphans. Meeting with Dusty, Fukutaro learned the method to build the raft. Later he collected 330 plastic bottles with help from the Kamon-kai members and friends. 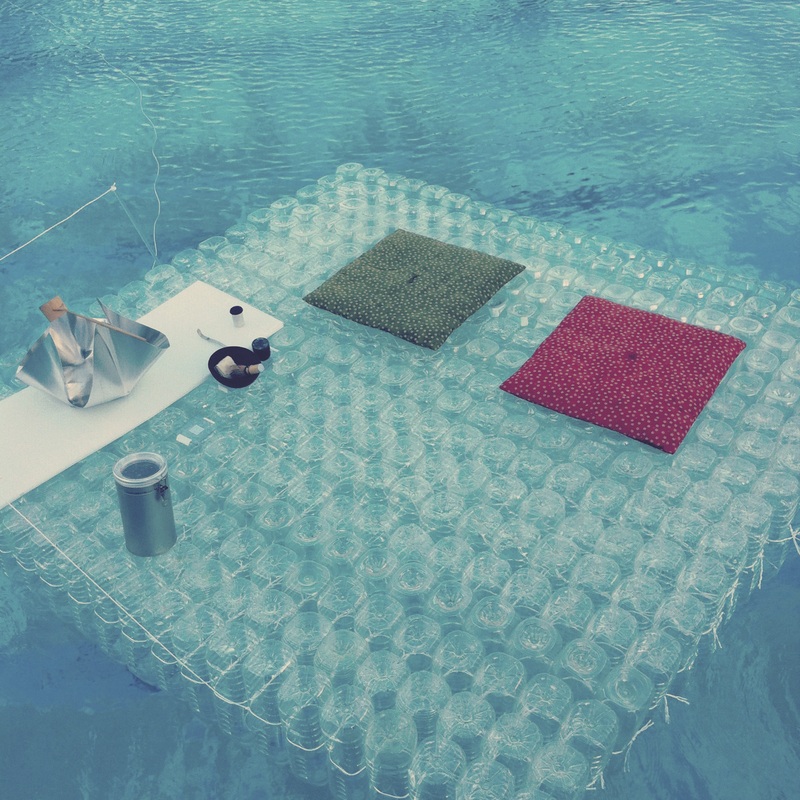 After countless times of trial and error, he created his floating tearoom in three years. During a conversation with a textile owner who enjoyed playing the Shamisen (Japanese stringed instrument), we asked why he began to practice. He explained that with the Shamisen he can play a song so that the Maiko may dance or sing together. In the days of the Kamakura and Muromachi periods, it as a popular pastime to gather in temples for furo-furumai bathing parties, to which guests brought tea, sake, and food to share after taking baths. “Drinking tea” and “taking a bath” are both basic parts of everyday life, but when shared in the form of tea parties and public baths, “tea” and “baths” suddenly become something quite special. 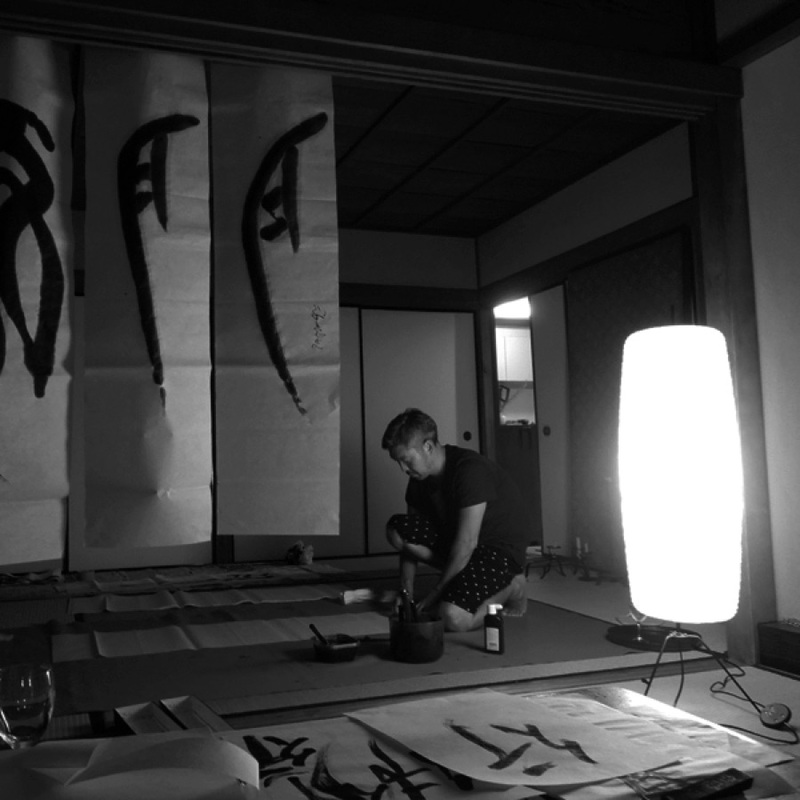 Tōtōsha also hosts and co-hosts a range of other events, such as art exhibitions, nighttime shodō calligraphy events, and tea demonstrations at various local events and festivals. Their home has engawa decks, tokonoma (an alcove), itanoma (room with wooden floors), shōji (wooden sliding doors with paper) and a Japanese-style garden. It is a traditional Japanese-style house that most people today would deem nostalgic. 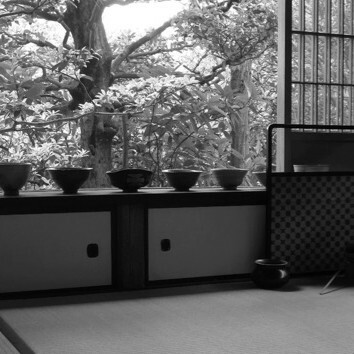 The tatami-matted room on the first floor functions as the official Tōtōsha tearoom. Born in 1986, in Saitama prefecture. Drawn to Kyoto, home of his mother’s side of the family, he attended the College of Science and Engineering at Kyoto’s Ritsumeikan University. At university, he immediately joined the tea ceremony club. After graduating, he began practicing tea under Jack Convery Souko at Shotokuan. Now he has been practicing tea ceremony for 10 years. 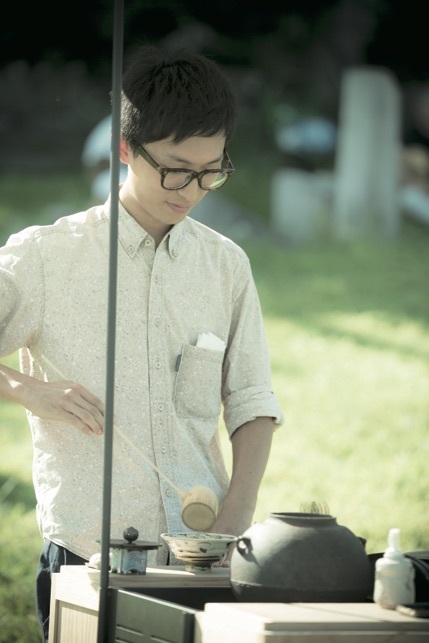 In 2009, he organized a tea ceremony group ‘KAMONKAI’, which is active in serving tea to passers-by along the Kamogawa river. On his weekdays, he is a marketing specialist for a machine manufacturing company. He likes to collect old and used tools, and frequently visits antique fairs and flea markets. Has a wide spectrum and has a sense as a producer. He is a responsible person who as a private business owner is able to manage things on his own. He has brilliant self-management skills. He takes action. She is a natural tea person, and I have great respect for her. Her tea is pure without a tense feeling. She deeply enjoys to do formal tea gatherings known as Chaji. On the other hand, she has such a friendly Latin character. I also admire how she alone to another country in order to pursue her aim. ￼A woodcut block with a Buddha motif purchased at a flea market held in Toji temple, that is hanged in the alcove of the tearoom instead of a usual kakejiku (scroll painting). As stated in the Nanpōroku, a text attributed to Sen’no Rikyu, “The tea ceremony of the small room is above all a matter of practicing and realizing the way in accord with the Buddha’s teachings.” As noted, tea is inseparable from Buddhism, and because the kakejiku acts as a vessel in order to come closer to satori (enlightenment), he feels this Buddha woodcut has the same leverage as a jiku. Born in 1988 in Korea. Both his parents are Japanese, but because of his father’s job, he has lived in Russia, United States, Syria and Ukraine. He speaks Japanese, English, and a little bit of Arabic. 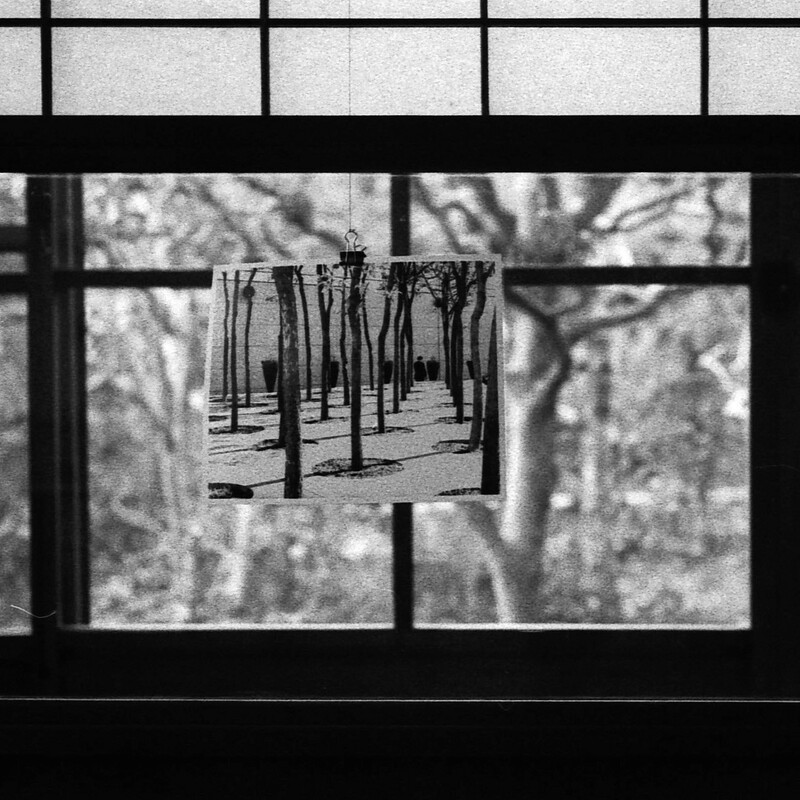 He began living in Kyoto when he started his Architecture course at the Department of Design in Kyoto Seika University. 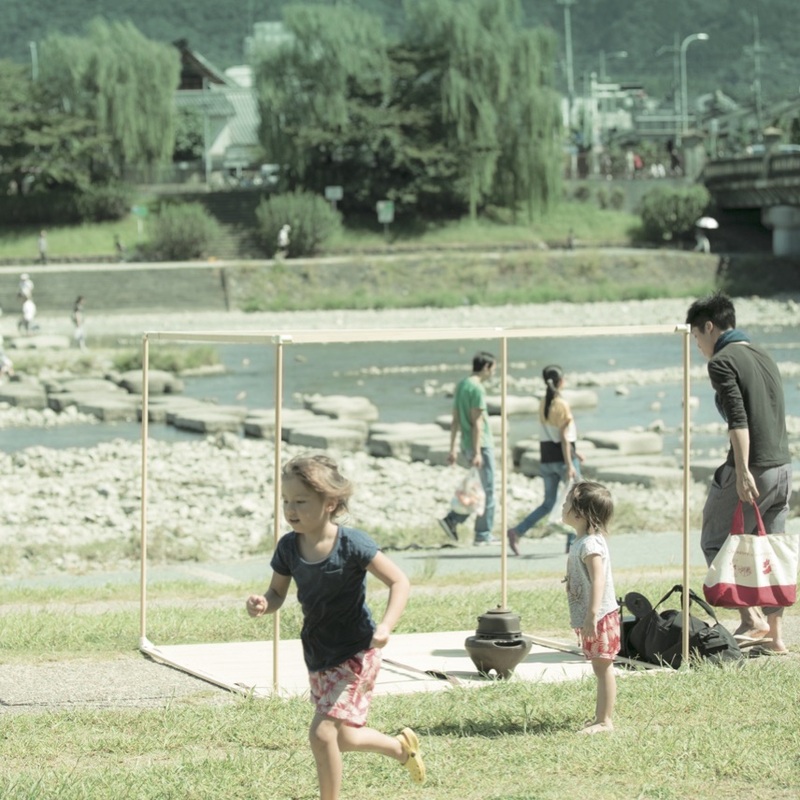 Today, he is a freelance architecture designer, involved in various project outside of Kyoto. He started tea during his college years, and is now in his seventh year. On his days off he enjoys biking around Kyoto. He’s just so imaginative- he never does the same tea event twice. His creative sense in setting up the tearoom for our events is always unique. I think he is constantly pushing the boundaries of contemporary tea ceremony. She’s so full of energy! I’ve met with a lot of people from my past experience of living in different countries, but she’s one of the most active and tireless. And that definitely translates into her powerful manner when she makes tea. Furosaki byobu (two-panel folding screens). Custom-made by Toto Akihiko, a karakami (woodblock-printed paper) artisan and the founder of the Kira Karacho studio. One panel depicts is a motif designed for Totosha, while the other features Dairiku’s beloved nanban shippo design. Born in 1987 in Santiago, Chile. At 19, she began her studies of Japanese culture at the University of Hawai’i. At 22, she studied at Doshisha University in Kyoto as an exchange student. 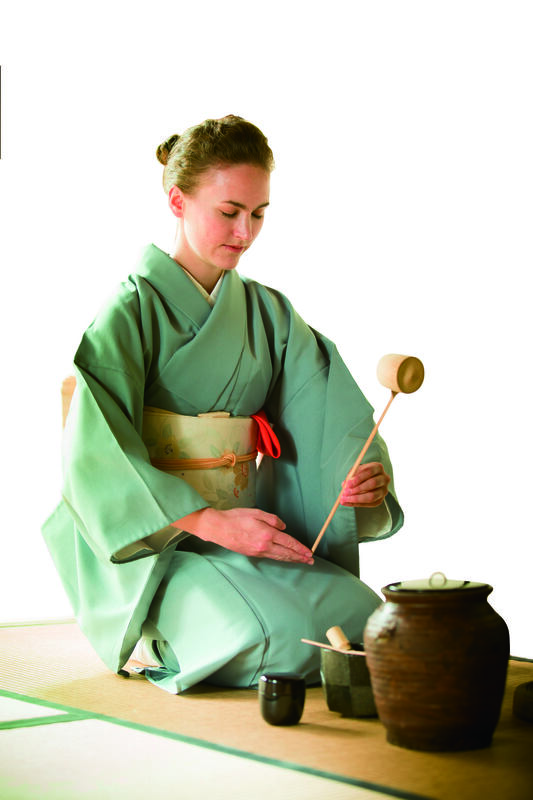 Majoring in Japanese studies, she wrote her thesis on Japanese Tea Ceremony. She returned to Kyoto and eventually moved together with Dairiku and Fukutaro. She works at the sales department at a well-established tea company, Marukyu Koyamaen where she also guides foreign visitors. She likes hiking, Zazen, dancing, and music. Knows a lot about tea ceremony. He is “blossoming” as a person because he has tea in his life! He is a gentle and caring person, like cooking for us on days when I’m tired. I think he’s much friendlier since the first time I met him. He’s enjoying his life through tea. I think he is a very sensitive person and I enjoy listening to his experiences. For example, his perception about taking care of the garden and observing nature. An old water container, a piece of Tamba pottery. She found it at the flea market of Toji temple. She loves its earthy natural subdue colors.